Probably the first thing you notice is that I'm advertising a pool hall, in fact wishing you Merry Christmas from White Pool Hall. I've only been hanging out here about a month and already Gus heard I had a blog and a good reputation for web design, so he spotted me a few drinks for coming up with this ad. The extraordinary thing about all this is that I'm even in a pool hall. And that I'm actually getting over the guilt, since a bunch of the guys here have really befriended me. They're very friendly, and of course they get friendlier as the night goes on, not being afraid to put a few away. But me ... in a pool hall! Which was a dirty word when I was growing up. Anyone -- you, your dad, anyone -- who went to a pool hall was scum of the earth. They were drinking away their paycheck, their kids were dirty and poor, and they didn't belong in polite company. But now here I am! And while all that is absolutely true -- I've never seen such dysfunctional families -- the guys are honestly very friendly ... and generous with their paychecks, buying drinks, treating me to pool games, etc. I made this big switch in my personal life when my Mom died in August. It's been a hell of a year. The thing is, you see, she was the one who came up with the rule against pool halls. It was "God's will," and all the rest... That would be the same God who took my Mom. Kind of a downer, first giving her cancer, then making it so she was the wrong blood type to get the best radiation, then complicating things with her diet so she'd waste away, and finally ... the bitter end. Right then I vowed what anyone in my skin would say: That's the way you wanna play it, I'm going to pool halls! The weird thing about my childhood was: We always had a pool table! I think Mom and Dad were trying to convey to us that good families could still play pool, just not at pool halls. We played Rotation, 8-Ball, and a game I made up called Jackoslovitch, which was kind of like hockey, played with pool cues broadly swiping the table. Now, of course, those days are long gone. Everyone's dying off. We're all getting old. I think about Mom all the time, too, at the pool hall. Hoping that maybe she's not that ticked off in Heaven, since, after all, I am 60, old enough to veer off the straight and narrow path from time to time, depending on how I choose to live. Hey, hey! A truck driver kind of guy, a big burly Dutchman -- Jake -- just came in the door. They act like I'm "the Professor," since I know big words and still act a little uptight. I'm also the kindest guy here, but I'm hoping to get coarser as time goes on. But, really, doesn't the world need sweet guys too? About the advertisement -- Hope you like it. 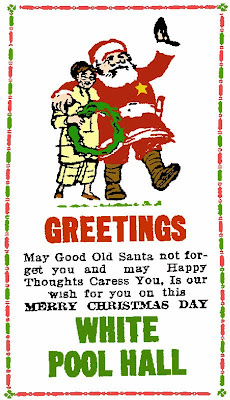 We really do wish that Happy Thoughts Caress You at Christmas. 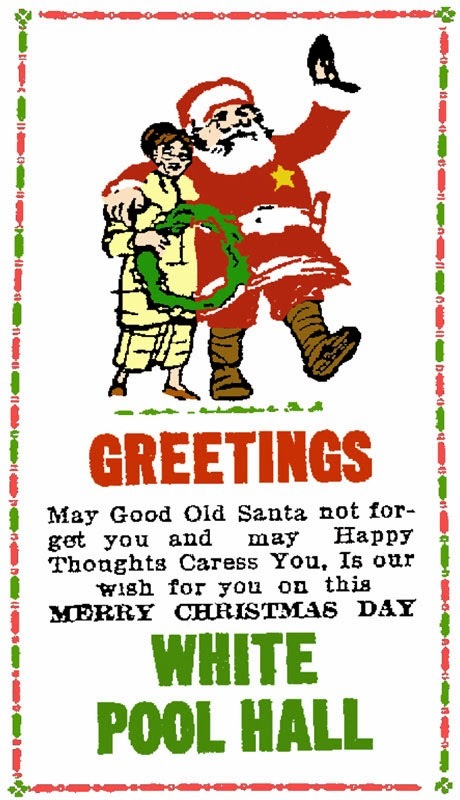 And that Good Old Santa doesn't forget you and yours. Christmas is for the whole family, but I always say it's really all about the kids. And I'm thinking I'll probably try a few interventions with some of the guys here, to get them to not waste their whole paycheck on drinks. A few's nice, yes, but I don't like the idea of kids suffering. Definitely not at Christmas. I'm going to call that my strictest rule. That's it! Happy Holidays! All the best of the season! And stop in for a game! Mama don't allow no pool hall goin' 'round here. Rack them balls up anyhow!